The seal provides a safety standard based on California’s Proposition 65, passed by the voters in 1986. Considered the toughest consumer product safety law in the US, Prop. 65 is intended to help Californians make informed decisions about protecting themselves from chemicals known to cause cancer, birth defects or other reproductive harm. Prop. 65 safety measures, in many instances, are stricter than federal, industry and European Union standards. 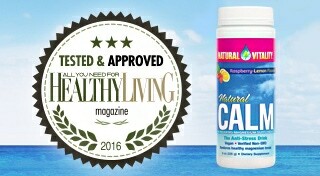 Independent from and unknown by Natural Vitality- makers of Natural Calm, the HealthyLiving Foundation independently purchased and tested all Natural Calm ionic magnesium citrate formulas for chemical toxins including inorganic arsenic, cadmium and lead and notified the company of its product’s tests and passage only after test results were analyzed using standards of the California law. “We are pleased to receive the Tested & Approved Seal which validates our stringent efforts to ensure the safety and purity of our ingredients,” says Natural Vitality president Justin Farmer. “It’s an excellent program that independently and objectively speaks to the needs of customers and retailers."